The new Batman movie has garnered many excellent reviews and in my opinion deserves all of their praise and more. The movie delivers on the clichéd ‘summer blockbuster’ action front as well as a deep character driven morality play, fraught with symbolism and tragedy. In this new installment of the caped crusader, we find Bruce Wayne fighting crime in Gotham City. He is tolerated by the policemen for his help capturing criminals, but there is an unease about the mysterious figure whom some believe is actually just a new brand of bad guy. Even the public views him with distrust and suspicion, hence the name ‘The Dark Knight’. 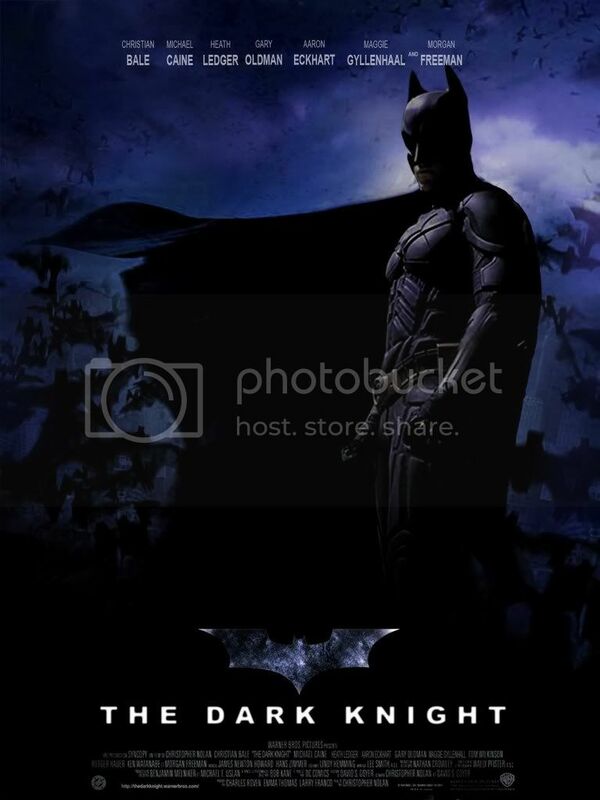 Bruce wants to give up his nocturnal exploits to marry his beloved Rachel, a lawyer who is aware of his secret identity and refuses to be with him as long as he continues to be Batman. For now, our hero has given up her love to protect the city; it needs him and his special brand of justice to keep it safe. Enter Harvey Dent- the new flawlessly moral, incorruptible District Attorney. His reputation for justice precedes him. Eager to find corruption where ever it may lie, he chases murderers, drug dealers and bad cops with equal fervor. He forms an uneasy alliance with Batman and Commissioner Gordon to bring a ring of mob bosses to trial, thus causing the press to name him the ‘White Knight’. Bruce Wayne sees salvation in Harvey Dent. He feels he can put away his cowl and leave justice to the new DA. This leaves the city with a protector and him free to marry Rachel. The only problem is, Rachel is now engaged to Harvey, and the mob bosses are after her as retaliation against the DA. Batman finds he must continue to wear his cape and work with his rival for Rachel’s well being. The Joker, a new criminal mastermind, surfaces against the back drop of the convoluted love triangle and Bruce’s internal battles about his identity and purposes. He is vicious and maniacal in a way that disturbs even the crime bosses of Gotham City, assembled to decide how to best protect their investments. He performs a ‘magic trick’, making a pencil disappear from the table in front of him in a particularly gruesome manner. Watch for this particular scene in the movie, I can guarantee the whole audience will give a collective ‘Ughhh’. The Joker, brilliantly played by Heath Ledger who will no doubt receive a posthumous Oscar nod for this part, manages to confuse everyone. Why does he do what he does? He shows no signs of desiring either money or power as proved when he burns a pyramid of money as an unexpected way to kill a rival. It falls to Alfred, Bruce’s butler to name the Joker’s particular vice; he just wants to watch the world burn. Each time he kills someone, he tells a different story about how he got the tell tale scars on the corners of his mouth, giving him the garish appearance of a grin. He goes about killing, burning and causing mayhem with a vengeance that is reminiscent of Alex in ‘A Clockwork Orange’. When Joker speaks he smacks and licks his lips in a distracting manner, his makeup is always smeared and smudged, suggesting decadence and decay. He brings a horrifying ‘joie de vivre’ to his work that is impossible not to stare at. In a particularly memorable scene that has him in a nurses’s dress, complete with white hose and shoes, he skips gaily down a city street, blowing up buildings in his wake with a remote control. The implied reference of ‘helping’ in the uniform of a care giver and the destruction of a previously imagined ‘safe place’ –a hospital, is poignantly ironic, not to mention disorienting in its absurdity. But I wanted to stand up in the theater and ask them to rewind so I could see the airplane scene again! As we were leaving the theater, that was the scene most people were talking about. Heath was amazing. If he doesn’t get an Oscar, I will be teed. THIS is the summer blockbuster movie, IMO.